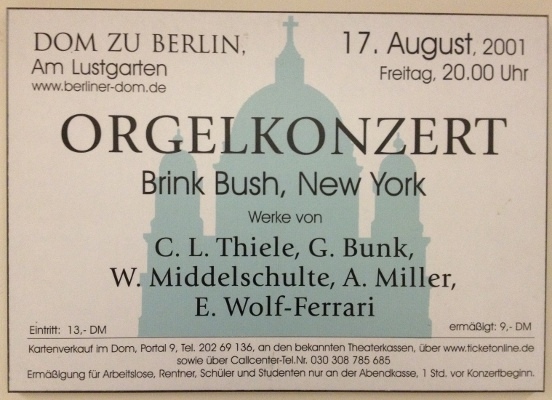 Brink Bush is one of the leading interpreters of German Romantic organ music in the world today. He has performed extensively throughout the United States and Europe and made his German debut at the Berliner Dom. He was featured on American Public Media’s "Pipedreams" in a program titled Bach, Bush and Middelschulte. 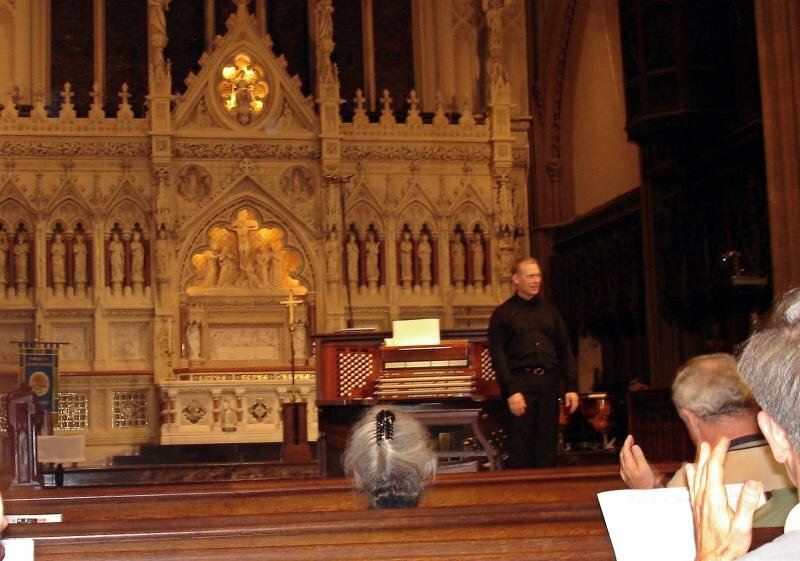 His New York debut was heard at Trinity Church Wall Street during the "Virgil Fox Legacy Twenty-fifth Anniversary Concert Weekend". 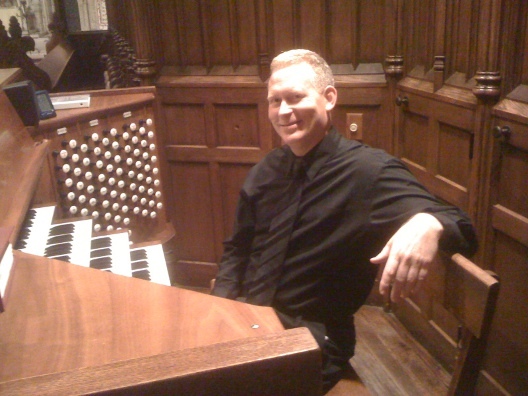 Mr. Bush studied organ at Peabody Institute, the Juilliard School, and the Eastman School of Music. His principal teachers include David Craighead, Robert Elmore, Russell Saunders and Rosalyn Tureck. 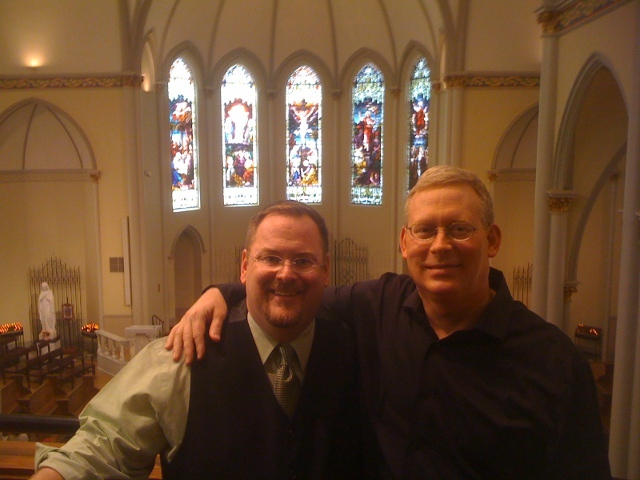 Mr. Bush specializes in the German Romantic repertoire, especially the works of Gerard Bunk, Felix Mendelssohn, Wilhelm Middelschulte, Max Reger, Gerard Strecke and Ludwig Thiele. He has been sponsored by the Middelschulte family for three consecutive trips to Germany for his research on Wilhelm Middelschulte. Mr. Bush has lectured at Yale University on the "Life and Works of Wilhelm Middelschulte". His recording, Volume 1 of the Complete Works of Wilhelm Middelschulte, was released in October of 1999. Mr. Bush’s article on Wilhelm Middelschulte appears in the New Grove Dictionary of Music and Musicians. 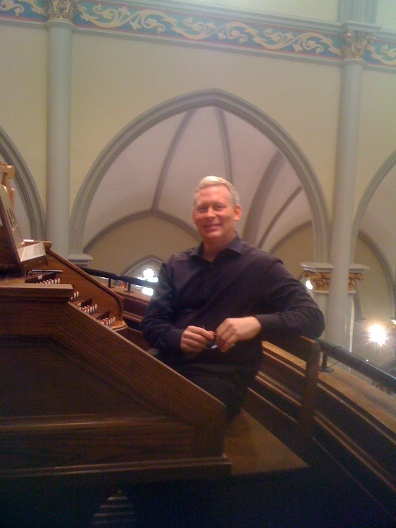 He is the editor of The Innermost Secrets by T. Ernest Nichols, 2005, an analysis of the Virgil Fox technique, and is the primary contributor to the new Wilhelm Middelschulte: Complete Organ Works I published by Baerenreiter, 2007.
" 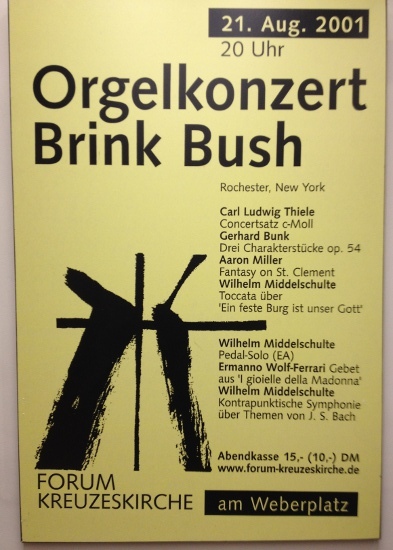 Brink Bush brought Middelschulte’s blazingly re-imagined transcription of the Goldberg Variations to life. Mr. Bush reveled in all the color of the organ; and never shrank from taking full advantage of what it had to offer. It was an enjoyable and quite interesting half-hour. " " Brink’s performance of the Goldberg Variations in Middelschulte’s technically challenging, and musically inventive arrangement, kept the audience’s attention from start to finish. His polished technique and musical playing provided an ideal vehicle for this much-loved piece, heard in a different context. The colors of the organ added greatly to the already magnificent composition, and Brink handled the pacing of the various movements with great poise. " " I am hugely moved by your musicianship! Your playing this most mechanical beast we so adore, and being able to leap over it, and force it to ‘sing’… you, Brink, are unique and a marvel. " " That program of Middelschulte's compositions was a real tough one. I was very much impressed with your playing. Your technique is flawless but even more, your sense of phrasing is impeccable and you have a very keen sense for registration. This is not a common virtue with many organists today. You show a mastery of the organ. Wilhelm Middelschulte would have been very proud of you! " One of the last pupils of Wilhelm Middelschulte.
" Mr. Bush was in comfortable control of the prodigious technical demands of this material and he fully utilized the sonic resources of the instrument to access the spirit of these compositions. " " We found his playing, all from memory, to be an exciting and thoroughly satisfying experience. His technical equipment seems to be adequate to the most demanding scores, and his sense of musical form and shape equally sensitive. Our faculty was immensely impressed. He is surely a musician/performer of high order. " 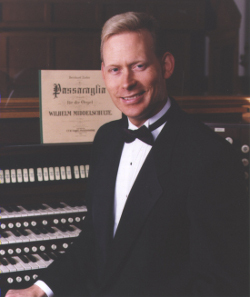 " Brink Bush is an excellent musician and organist and stands with the very greatest players in the world. I recommend him without reservation. " " Brink Bush led a stirring concert of Organ and Brass music for the Berkshire Bach Society on 29-April 2017. Joined by trumpeters Eric Berlin and Richard Watson, Brink set the tone with a program of festive works by English, French, and German composers highlighting three different national styles and delighting the audience with displays of technical prowess. He performed five solo works by J.S. Bach, and led the ensemble in several short works by a variety of Baroque masters. His solo Bach was clear, clean, and captivating; his work with brass splendid; his rapport with the audience intimate and generous. All in all, Brink provided a thoroughly enjoyable musical outing for our Berkshire fans and an opportunity to glory in masterful Baroque repertoire and fine musicianship. He left his audience wishing for more. " " I wish to offer my personal thanks and gratitude as well as that of our RI Chapter AGO for your fine program and its contribution to the overall success of the convention. There were a great many comments on how well you played and how the repertoire fit so beautifully for that organ and in that space. Here is a representative sampling of some of the comments "
He was very good. The setting also played an additional influence in the enjoyment of this concert. Well in touch with interesting branch of the repertoire. This was great and I enjoyed Mr. Bush. Pedal piece was very impressive. Incredible artistry, musical, mature playing. Everything he played was new to me & distinctive. The Passacaglia was a tour de force. Thank you for German Romantics. Strong technique, thank you for some memorization.
" Brink Bush launches this disc with this warhorse, the Perpetuum Mobile, played cleanly and at a Virgilian Tempo "
" If you appreciate supreme playing of the highest clarity, musicianly control, judgment of tempo and rhythmic excitement, this [CD] is for you. Brink Bush's impressive credentials are matched by his authority in all this music: stunningly immaculate playing of verve and refinement." 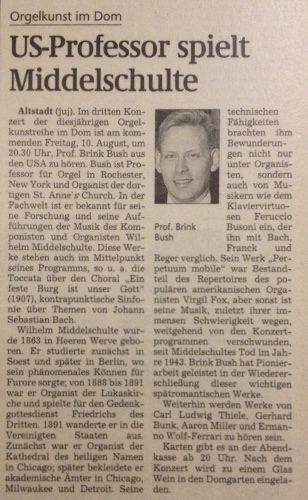 " Brink Bush made a superb presentation to our graduate students on the music of Wilhelm Middelschulte. He has immersed himself in this heretofore unexplored area so thoroughly that he has a vast store of information "on top of his head". Anyone who might assume that Middelschulte is only a peripheral figure among late-Romantics will be amazed at what he created. Brink Bush's lecture was, very honestly, a revelation and his finely produced hand-outs a highly valuable reference. " 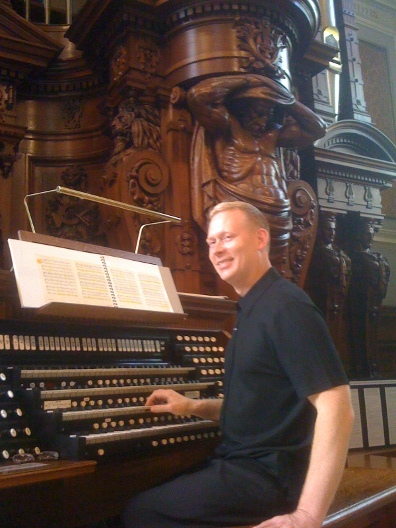 " Middelschulte returned to Chicago brought by German Romantic Organ Specialist and enthusiast Brink Bush. Armed with a power-point presentation accompanied by numerous recordings of Middelschulte's compositions, Mr. Bush brought to life again the music of Middelschulte. The assembled workshop participants were treated to a rare scenic window into the life and music of this ' Master of Counterpoint '. Certainly Brink Bush is well-qualified to share his knowledge of the life of Middelschulte. 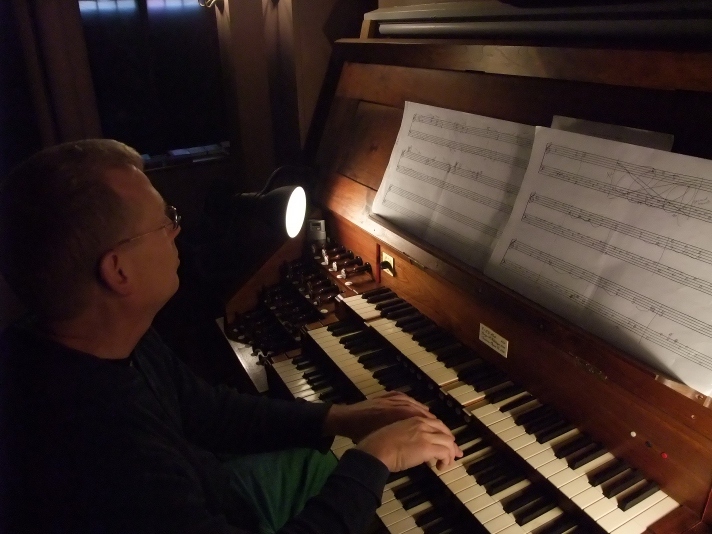 It is only hoped that this brief synopsis of the music of Middelschulte by Brink Bush will entice many other organists to tackle this music by the ' Master of Counterpoint '! " All material on this website © 2017 Brink Bush. All rights reserved.